The FA Level 1 in Coaching Football is the first stepping-stone on the core coaching pathway. It provides learners with an introduction to coaching the game and working with players from under 7 to open age. 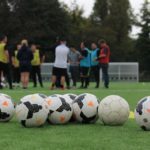 You will gain an insight into the game in England, how it is played and how you can coach to better support the development of future players. 07/04/19, 14/04/19, 28/04/19, 05/05/19 & 12/05/19. If you are interested in attending please email communications@gurunanakfc.co.uk.